This week I had the opportunity to speak at a special panel on reading frameworks. 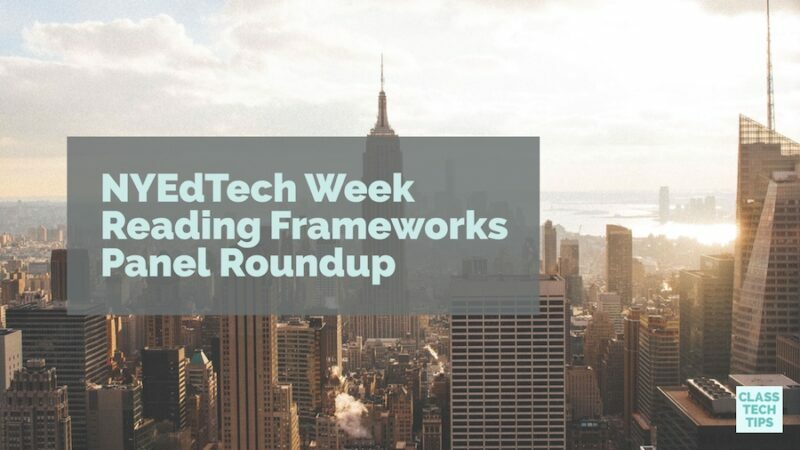 It was held at this year’s NYEdTech Week. The awesome folks at MoxieReader (a tool I first shared earlier this year) invited a handful of educators to share their thoughts on reading in today’s classroom. It was lots of fun connecting with other passionate educator. I shared different ways digital tools can be used in the reading classrooms. Over the past few years I’ve had the chance to work with the amazing team at LitWorld. Amber Peterson the Director of Program Innovation of LitWorld and World Read Aloud Day, spoke to the group. 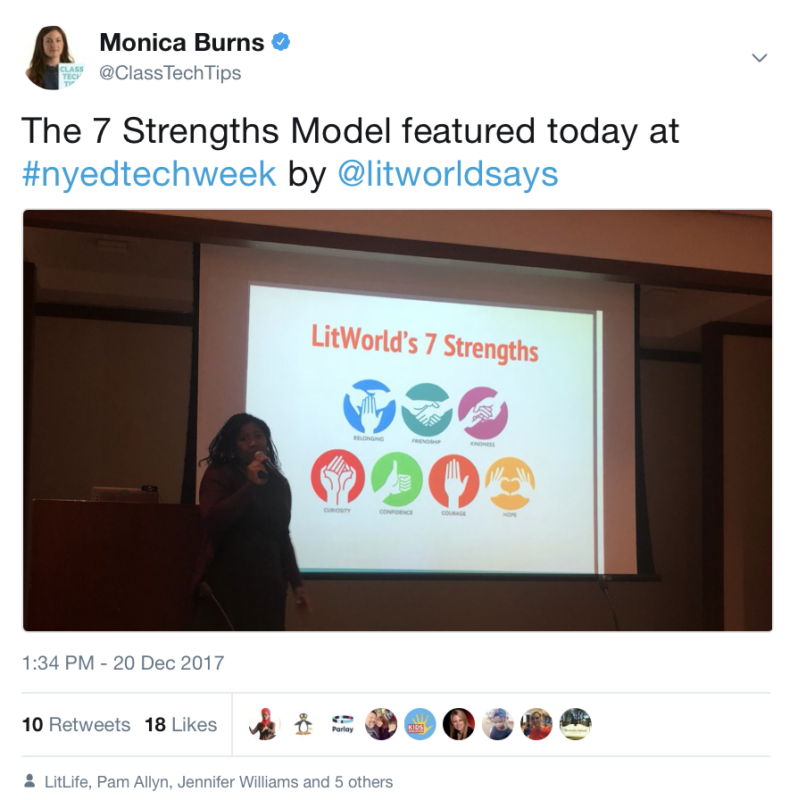 She shared LitWorld’s a 7 Strengths Model and discussed the success stories of reading communities. 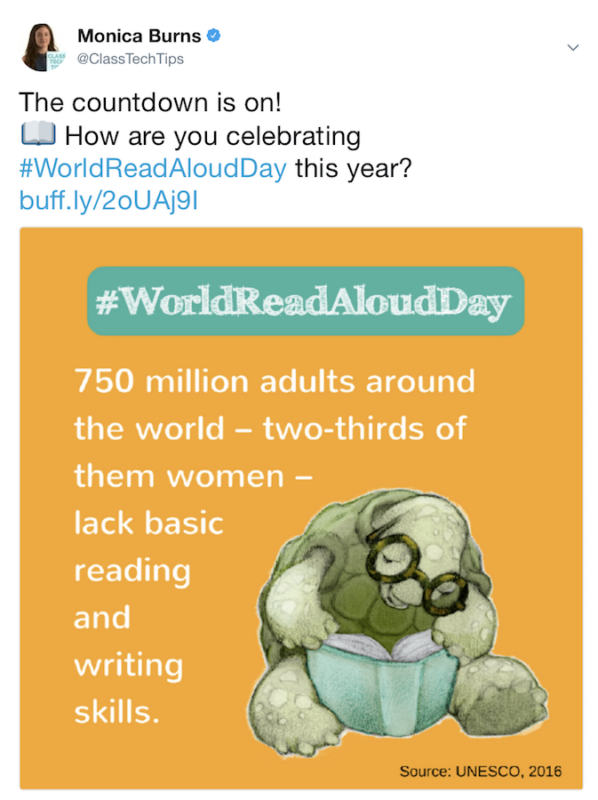 Amber also spoke about World Read Aloud Day scheduled next year for February 1st. If you haven’t participated before, this special event is an opportunity to share the power of storytelling through read alouds. It’s a global event with participation growing each year especially perfect for educators. Learn more about World Read Aloud Day by visiting LitWorld’s website. You can also check out these digital resources for World Read Aloud Day I gathered last year. The panel also included Charlotte Danielson of The Danielson Group. Esther Klein Friedman the Executive Director of the Department of Literacy for the NYC DOE spoke as well. Andrew Fletcher the Director of Early Literacy for the New York City Department of Education also spoke on the panel. They each shared observations and goals for future practice related to reading instruction. As a former New York City public school teacher it was wonderful hearing from Department of Education staff about upcoming initiatives related to early literacy. Having spent time examining the Danielson Framework as a classroom teacher, it was definitely a treat to hear Charlotte Danielson speak to the ways we think about reading instruction in the context of her framework. During my part of the panel presentation I spoke about readers as viewers and listeners, as well as creators of digital reading responses. I shared a few highlights from Taming the Wild Text: Literacy Strategies for Today’s Reader, the book I co-authored with LitWorld Founder Pam Allyn. As consumers, students have access to a wide range of resources on digital devices to enhance traditional reading experiences. I shared a few virtual reality tips to help students build background knowledge of a topic and one of my favorite kid-friendly podcasts. As creators, students can reflect on their reading lives. They can record their own podcasts with book talks and producing book trailers to share with an authentic audience. I’m so happy that the team at MoxieReader brought together this group for their Reading Frameworks panel! It was lots of fun spending the afternoon chatting about topics we are all passionate about too. We also explored the connections to the ways technology can facilitate deeper reading experiences for students. As we all continue to think about the power of technology in the reading classroom it’s important to identify quality uses for technology in the classroom! If you’re interested in learning more about MoxieReader and their independent reading app, check out this post on my blog which shares more information on this powerful tech tool!